← Calling Time on the ’60s; Hof Alert in the Hansaviertel! 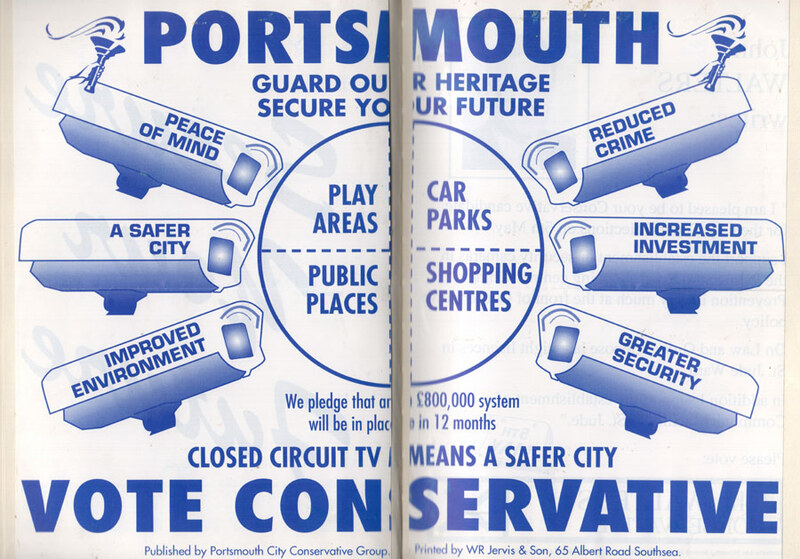 This was how Portsmouth’s Conservative Party were runnning for office in the local elections of 1994, when I was a student living in the city. What struck me then as a sinister and deeply absurd bit of campainging, hasn’t lost any of its crassness now, and if anything has become more potent in the wake of David Cameron’s pronouncements following the UK riots this summer. But three years after these flyers circulated, Blair’s New Labour were in power nationally and CCTV cameras became a ubiquitous feature of the urban environment all the same. Close to half a billion Pounds have been spent on CCTV equipment in London alone, but internal Metropolitain Police reports warn of their neligable role in crime prevention, with only 1 in 1000 crimes solved using CCTV images in 2008. Caught-on-camera riot galleries and Flickr dragnets are probably part of a wider strategy to improve these figures. Down a couple of pints of export strength lager in some Southsea boozer, and the flyer might start to resemble something Vorticism threw up. But the cheap single-colour printing, berk typography (Futura with Eurostil?) and the martiality of the target motif make for an ugly bit of populist urban propaganda. The implication that car parks and shopping centers constitute “our heritage” now reads less like dark humor and more like grim self-fulfilling prophecy.